Looking for a USED KT 600? The machine has two method to drill the hole. Solid drilling and count boring. Max dia. for solid drilling is 300mm and the other max dia. is 600mm. All max length is 15000mm. 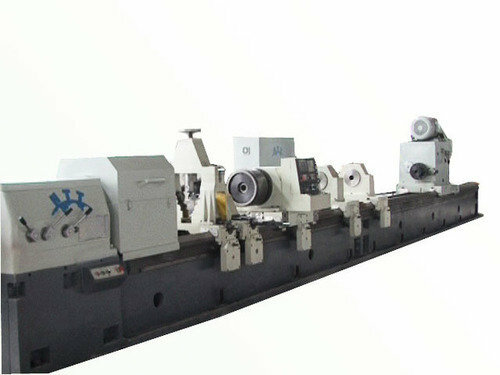 After introducing new deep hole drilling technology from Germany and UK, we had launched several new types of deep hole drilling machines including extra length horizontal machine for shaft, and column machine for mold and irregular part to drill multiple off center holes and 4-spindle pellet die gun drilling machine. Products are widely used in automotive parts, mold manufacturers, hydraulic and aerospace industries. HTT is the only representative of China that attended the EMO exhibition holding in Hanover, Germany 2007 and got received a great success. We exhibited a set of CNC deep hole drilling machines, and then succeeded in signing the sale contract of the machines. In the Chicago Show of 2008 (IMTS), HTT, cooperating with the UK MOLLART and Germany BOTEK, took part in the exhibition. This has proved that we have become one of the most advanced company for deep hole drilling technology all over the world. We have been cooperating with foreign advanced deep hole drilling machine tool factory. We also have many deep-hole drilling machines exported to the United Kingdom, Switzerland, Singapore, Taiwan and other regions in North America. Customers include Mahle, Andritz, CPM, ZF, Bosch and many US, European joint ventures in China. Our goal is to be NO. 1 in deep hole drilling in the world. All staff will work hard to achieve this goal. With quality management certificate ISO 9001: 2000 and CE certificate for drilling machines coming into the European market, HTT is your reliable partner for deep-hole drilling machines, job-drilling and German Botek tools. Looking to Purchase a New HTT KT 600?